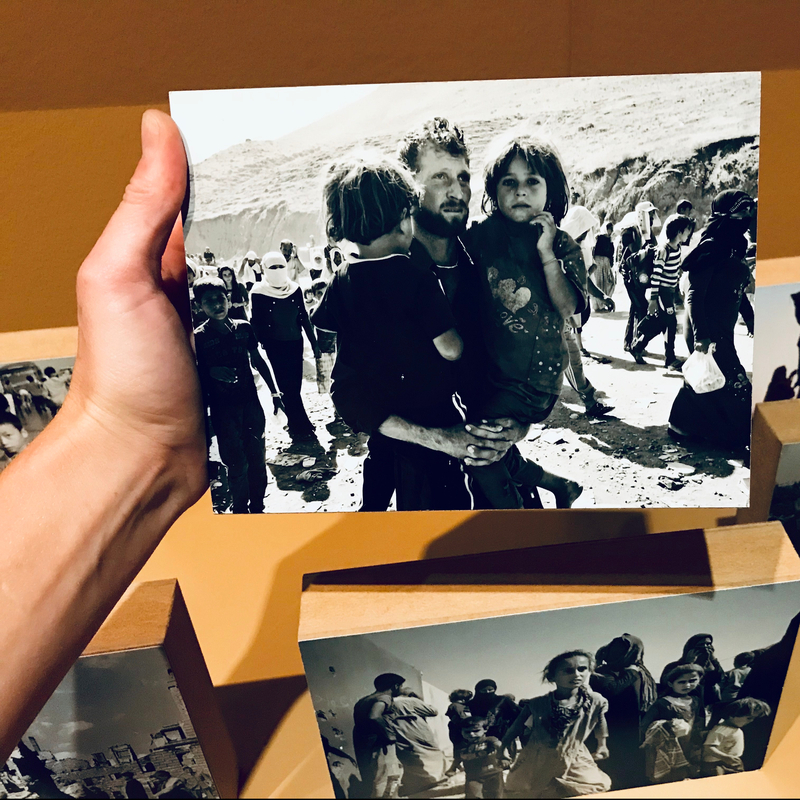 The Musée international de la Croix-Rouge et du Croissant-Rouge, has recently brought together more than 300 images of displaced people, in EXILE, a temporary exhibition of photographs telling stories of migration from the decades. Refugees and displaced peoples now make up almost 1% of the world’s population, according to the UNHCR. The EXILE exhibition at the Red Cross Museum is a reminder that over 65 million people are displaced – thats almost 1% of the world population. The museum brings the story of human identities, migration and displacement to life in a small room field with photography from the Magnum Photo Agency photojournalists. The exposition and its theme are already compelling, grounding the viewer in the stories from across the world and decades (1930s to today) with the brutal facts and images reminding us on the changing boundaries, new identities, struggles and celebrations. But what caught my attention in addition, even beyond the content of the exhibit, was also the unique experience of making the photography tactile. As you enter the room, the visitor is invited to pick up, touch, and engage with the photographs that line the walls of the room. The room is almost overwhelmingly barren except for this display. Each photo is printed on a wooden block, ranging from 3 inches to about 15 inches in size, displayed along the museum walls. On the back of each photo, the details of the photographer, the year, and the image and location with a short description of the migration or displacement story being told. The visitor experience is somewhat surreal, as it combines a much higher intimacy as you view the photos, juxtaposed with a more revealing exposure of yourself – others can physically see you choose certain photos, and these choices could be revealing. It is a paradox of being more private, and at the same time, more revealing. Voluntary yet mandatory – Somehow the tactile element is both an offer to engage, as well as a mandatory experience. Without touching the photo, picking it up, you cannot learn the details. And so, you are compelled to pick up different photos, selecting as you go. Possession, you choose your photo – By picking up a photo, you are choosing it. Moreover you obstructs anyone else from viewing the photo at the same time. The scale of the image is small enough that, for the few seconds when it is in your hands, you seem to own it. There is nobody looking over your shoulder, no polite stepping back so somebody else can see the image. It is, somehow, yours. Exposure, your viewing is shared with the other visitor. Each visitor also interacts with the other visitors by sharing the same space. The action of picking up the photo is revealing, it is a sign of something that interests and engages you, and as a visitor you cannot help sensing and noticing when others pick up a photo, a certain curiosity about their own selection and the stories that speak to them. Photograph by Moises Saman, born 1974. with accompanying comment as featured in the Red Cross Museum exhibit EXILE: “A displaced Yazidi man carried his two daughters as he crosses the border into the Kurdish-controlled northern Iraq, near the village of Fishkhabour. Thousands of displaced Yazidis from the Sinjar region took refuge in the Kurdish areas of northern Iraq after fleeing their homes as ISIS militant advanced. On the centre wall, one of the exceptions to the tactile photography featured along the walls, there hung a photograph series by Thomas Mailaender, born 1979, titled Cathedral Cars (Voitures cathedrale) 2004. According to the description in the expo, Cathedral Cars is a term used by dock workers in Marseille, France, to describe the vehicles piled high with belongings making the crossings from Marseille to North Africa. A reminder of the shape of the cathedral, and of the items being brought back and forth as people cross borders. Overall, I would recommend the approach, especially for a smaller exhibition. The Exhibition Hall enables multiple visitors to review the photos, with a deeper connection but to fewer pieces. At the same time, I was slightly disappointed by the lack of further sensory effects – music recordings and audio could have played beautifully to the total immersion. Rene Burri (1933-2014), photo from Zurich, Switzerland, 1956. Hungarian refugees fleeing the national insurgency.